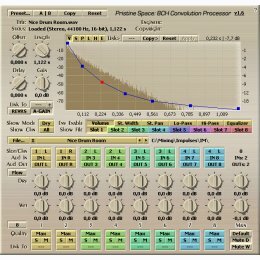 Pristine Space is a native audio VST plugin which allows you to use convolution reverb impulses in your audio projects. Pristine Space was mainly created for impulse reverb perfectionists: it does not implement various `combo' approaches which try to save CPU cycles by creating a synthetic reverb tail instead of performing a full convolution. Because such approaches in many cases give unsatisfactory results if you expect them to sound exactly like your original reverb impulse sounds, we have decided not to use them. Instead, we have optimized to the maximum both the efficiency of convolution processing and the plug-in's latency. Pristine Space is a 8-channel convolution processor. Each channel is independent of the others, making it possible to use Pristine Space in various surround configurations. It also allows the user to apply a `true stereo' kind of processing, where each stereo channel uses its own reverb impulse (requiring 4 convolution channels in total). 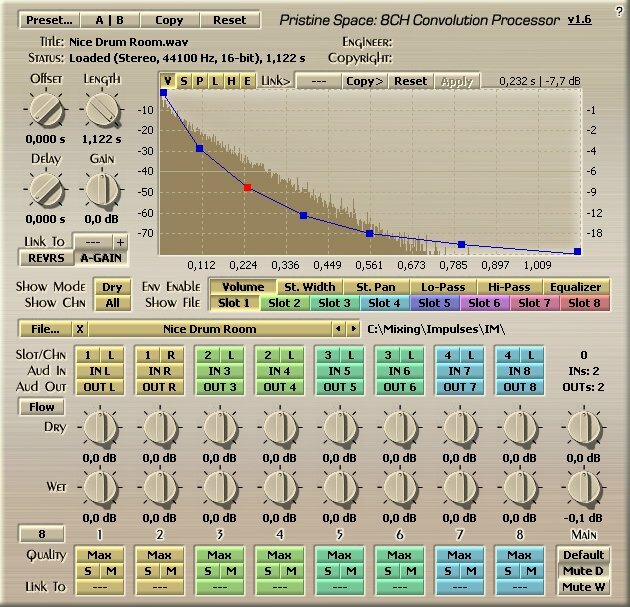 Sound designers and the like may find Pristine Space's serial convolution processing feature (which allows one to process the sound with several impulses in sequence) useful. While Pristine Space does not offer various radical impulse transformation features, it still offers several very useful envelope-driven non-destructive impulse editing options, including volume, stereo width, stereo pan, low-pass and high-pass filtering, and a linear-phase equalization. You can also reverse, cut and time offset the loaded impulse file with ease, non-destructively.